Pulling crackers at the dinner table is a big part of Christmas festivities. These days it’s not always possible for friends and families to get together locally, which is why Vodafone took the initiative to connect people during this special time of year. Recreating the tradition in a digital experience via a web app, now means friends and family can pull a cracker with each other – anywhere in the world. 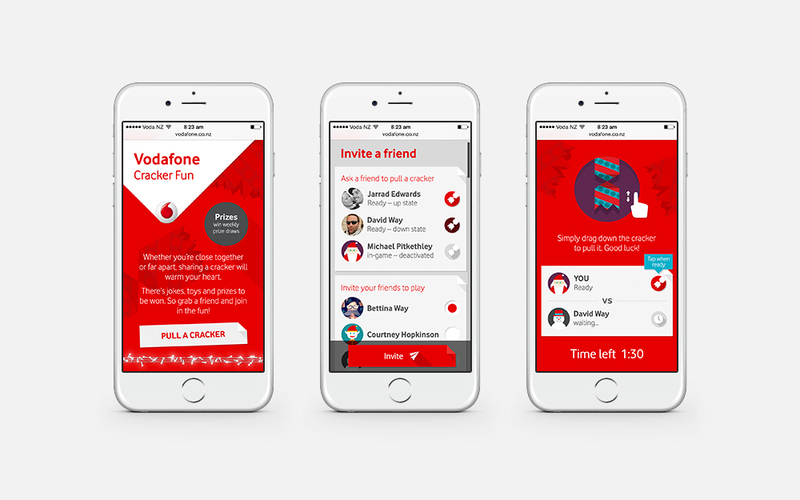 We created the UI, tasked with ensuring the experience works seamlessly – integrating the illustration components and the interface, whilst retaining the integrity of the Vodafone brand. The UI emulates the tactile nature of the paper Christmas cracker, considered right through to the subtle details suggested by the delicate folds, creases and shadows. Catering to an audience with a multitude of different devices, we were challenged to design a web app that would look and feel like a native app – all within the unpredictable environment of web. An incredibly short timeframe meant that we had to create a savvy system utilising reusable assets – ensuring maximum flexibility and efficiently within the build.